lomo la sardina sea pride camera, expired kodak ektachrome 160 tungsten film, cross-processed. 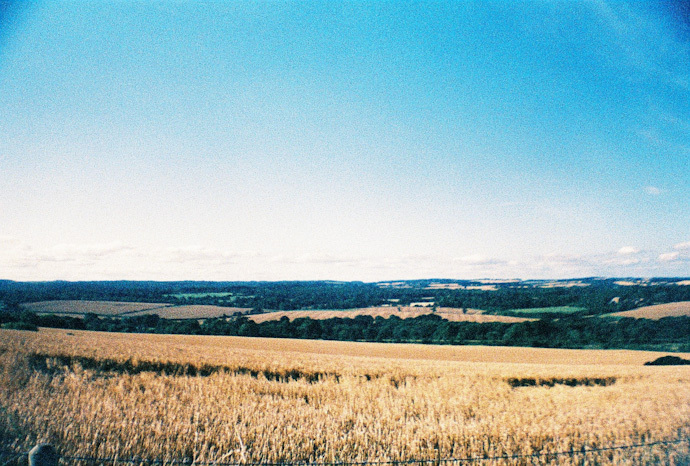 sadly not one of the best rolls i’ve had developed recently – this image was [by far] the best of a whole roll of 34. i took the lomo loaded with film to a wedding last weekend as my favourite digital lens came to an abrupt end recently and i’d nothing else suitable to use on the 5d. a less than satisfactory result is a risk i take every time i put a roll of expired film into a camera i guess. in hindsight, even the sx-70 would have been a better choice – i’ll take eight good images over only one any day. i will have to rely on my memory of the days events and photos that my friends made to remind me of the magic that happened. still, i’ve been to a lot of weddings over the years where i didn’t take a camera, so it’s only a change in my recent photography habits that have made this more of a tragedy in my mind. i am disappointed with the scans and i’m thinking about getting them scanned again because they are so grainy. has anyone else had this problem… grainy scans that could be better if the scan quality was improved? This entry was posted in a book of days and tagged experimental, lomography. Bookmark the permalink. i don’t have great advice as i am only beginning to dip my toes into film. but similar to what’s already been said, i like the grain. i tend to think it’s part of the charm and appeal. I don’t use film that much but when I do, I ask the photo lab to make a cd for me just because their scanner is like, top notch. -Yet still, there is always some grain. Maybe the noise reducer in photoshop? This photo is gorgeous, by the way.